It was a day so different from all the others. Swami always takes us by surprise and many a times it takes everyone's breath away. It was 7:30 a.m. when the music and Veda chanting resounded in Prasanthi Nilayam, and people hurried towards the scantily populated Sai Kulwant Hall. As Swami had not been coming for morning darshan for many weeks, not many used to gather in the morning, one can never take things for granted with Swami. Buddhist monks belonging to the order of the Tibetan Dalai Lama were in Prasanthi and they were seated alongside the staff. They had come prepared with chants for global peace and harmony. 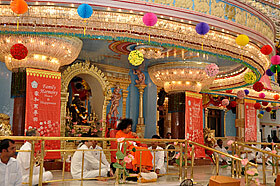 As Swami glided into the hall along with the golden rays of the Sun, it was a beautiful sight to behold. Swami took a detour after the marbled areas and via the portico, headed into the interview room. He called none for interview and after 20 minutes of being alone inside, He arrived on the stage. 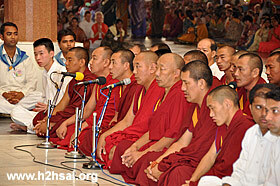 He asked the Buddhist monks seated in front to start chanting. And they began. Low and deep throated mumblings filled the air and the vibrations seemed to tingle the skin! It was not easy to understand the chants but this much was clear that they had great vibratory significance. And as they chanted, Swami sat listening. 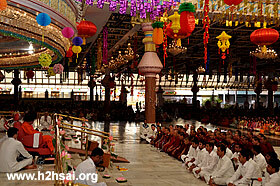 After about 20 minutes of chanting, when they concluded, Swami asked for the bhajans to begin. 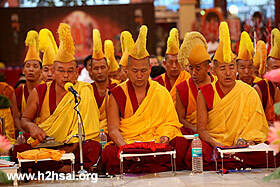 The singers too selected bhajans well and a multi-faith bhajan which adores Lord Buddha rented the air. Swami asked for the alaap bhajan, "Allahu Akbar". That was sung and was met with a heavy following. The decorations for the Chinese New Year had begun and so the stage area on the floor was populated with plastic lotuses. They presented a pretty sight and Swami too seemed absorbed in watching and admiring them. Everyone in the hall was so happy and thrilled at this unexpected darshan and bhajan session with Swami! He now called one of the monks and asked him about the evening's programme. 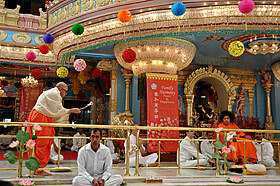 He told him to get the chanting started at 4:30 p.m. After this, Swami received aarthi and retired for the morning at 9:40 a.m. The evening saw the Buddhists seated in the marbled blocks. The hall was filled with beautiful decorations. 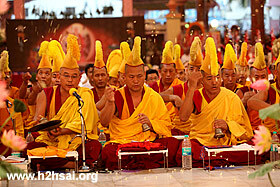 Red, Yellow and Green dominated the landscape and all the singers and participants for the evening's chanting programme were dressed in bright and golden yellow. 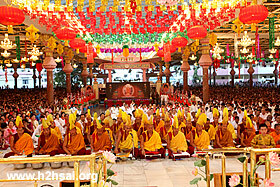 The chanting started after the Veda chanting in the evening. 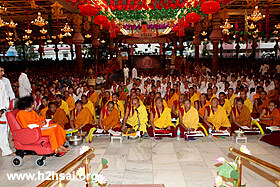 The sounds of "Aum Mani Padme Hung" filled the air and enthusiastic devotees joined in the chanting. After a while, that too ceased and in silence everyone waited to see the form of God. 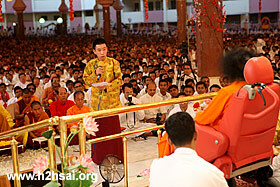 Swami arrived after 6:00 p.m. and took a detour after the ladies' side and moved to the stage. On the way, He spoke to the coordinator among the ladies' side. Then He took the second detour of the evening and moved along the lines of monks seated in the front. Going for the round in the reverse direction, He blessed the birthday boys. He arrived on the stage and asked for the programme to begin. 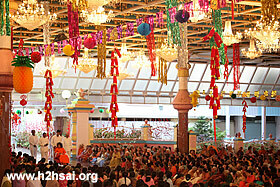 The presentation comprised of an offering of mantras for World Peace. And so, the Buddhists began to chant the "Aum Mani Padme Hung" mantra. Soon, the mantra built upon speed and everyone seemed to be chanting in a divine frenzy. This mantra is supposed to be very powerful and it is believed that there is not a single aspect of the 84000 sections of the Buddha's teachings which is not contained in this six syllable mantra. The programme was anchored by a young boy and he was explaining the significance of all the acts being conducted. The monks now offered as a mark of respect, coloured silk cloth which they placed on the railings in front of Swami. Swami blessed them and then the chanting continued. 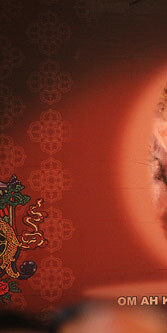 The next was the "medicine Buddha mantra" which is supposed to eliminate all diseases - physical, mental and spiritual. During the chants, they would throw up jasmine flowers in the air. Now and then bells would be rung and a gong sounded. That was followed by a special mantra called the "Bhagavan Sri Sathya Sai Baba eternal prayer" and this has been lovingly composed by His Holiness, the 17th Karmapa Ogyen Trinley Dorje! 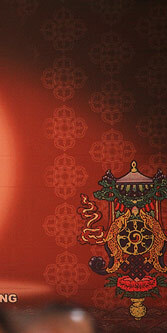 The next two mantras to be chanted were the Extensive Bodhisatva Ksitigarbha mantra and the long Dharani of Chenrezig. 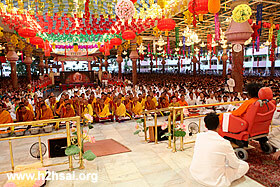 As these were chanted, all the participants made a kind of mudra with their hands. These were to bring permanent happiness to all sentient beings. 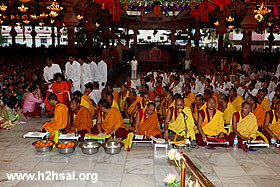 After all the extensive chants, some of which were rendered in song form, the participants prayed for Universal peace. 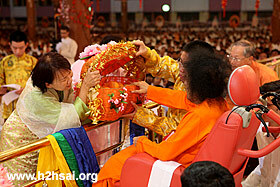 At the end, many of the participants took various items to the stage for blessings. This included a CD pack too. Swami blessed everyone and everything. Bhagavan also blessed juicy oranges for distribution and even as that went on, He spoke to the boy who had compered the entire evening. 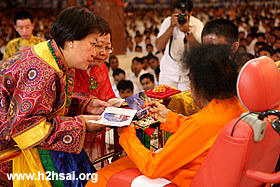 Swami had evinced keen interest in all that he was speaking and explaining. Many times, He nodded in agreement and also smiled appreciatively at what he was speaking. 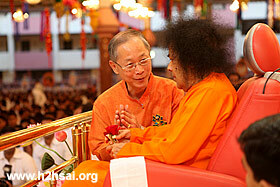 Swami asked him about the drama and said, "Start the drama now! I will see." The boy told Swami that the drama was scheduled for the next day. Swami agreed and made a face as if He had assumed that it was today! (It was already 7:35 p.m.!) He then had it announced that the next day, the Chinese New Year celebrations would take place and the drama would be held at 6 p.m. After that, He received aarthi and retired for the day.